Top liquid natural gas exporter Qatar announced it will hike its output by 30 percent in the coming years. The increase overlaps with an anticipated glut in the LNG market and efforts by U.S. companies to increase natural gas exports. LNG exports are a critical part of President Donald Trump's plans for American "energy dominance." Qatar Petroleum on Wednesday announced plans to significantly raise natural gas production in the coming years, creating an obstacle to President Donald Trump's goal of "energy dominance." The move threatens to add to a projected glut of liquefied natural gas, or LNG, as a wave of new projects come online in the coming years, including from the United States. The Qatari state energy company said it will double the size of a planned project in the North Field, the massive natural gas reserve in the Persian Gulf that has underwritten the country's rapid rise to wealth. That will allow the country to hike its total output of LNG from 77 million tons a year to 100 million tons annually some time between 2022 and 2024, according to the company. U.S. Secretary of State Rex Tillerson (R) meets with Qatari Foreign Minister Sheikh Mohammed bin Abdulrahman Al Thani at the State Department in Washington, U.S., June 27, 2017. Qatar is already the world's dominant LNG exporter, and the planned 30 percent hike over the next five to seven years could help it consolidate its grasp on the market. 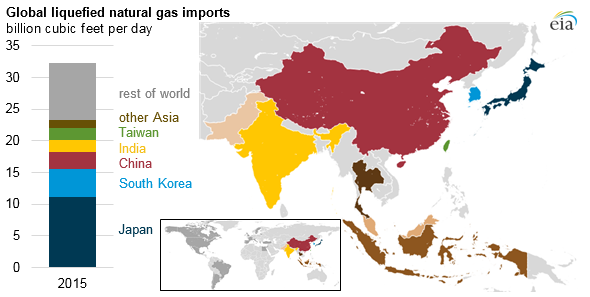 The global market for LNG was 258 million tons last year, according to the International Gas Union. U.S. companies hope to capitalize on a boom in natural gas production at home to grab a piece of the growing LNG market. Last week, the Trump administration touted LNG exports as a pillar of its plan to dominate the global energy trade. Cheniere Energy currently operates the only LNG export terminal in the lower 48 states, but four others are under construction in Texas, Louisiana and Maryland. They are slated to come online by 2021 and will push U.S. export capacity to 9.2 billion cubic feet — nearly equal to top importer Japan's total LNG imports in 2015. While demand is growing, analysts believe a surge in LNG export terminal construction will flood the market in the early 2020s, creating oversupply. The surge in Qatari output is expected to come online just as that flood hits. A supply imbalance could depress prices and make it harder to attract funding for new LNG export terminals. There were more than a dozen U.S. terminals proposed as of May, according to the Federal Energy Regulatory Commission. The Trump administration has recently created a headache for Qatar in the LNG market. In May, the Commerce Department reached an agreement with Beijing that will see China give state-owned companies the green light to negotiate long-term contracts with U.S. LNG exporters. Analysts told CNBC there is no guarantee the Chinese companies will import more American LNG, but they are likely to use the agreement to secure lower prices from Qatar and other exporters. The Trump administration has also sought to make inroads with South Korea, the world's second largest LNG importer, last week during an event the White House dubbed "Energy Week." The same week, South Korean President Moon Jae-in visited Washington, D.C., and Korean conglomerate SK Group signed memorandums of understanding to develop U.S. shale gas with Continental Resources and GE. Sempra Energy inked an agreement to explore jointly developing a Texas LNG project with the Korea Gas Corporation. Polices floated by the new South Korean president could offset the glut in coming years, said Massimo Di-Odoardo, head of global gas and LNG research at Wood Mackenzie. Those include reducing use of coal-fired plants and nuclear power, while increasing electricity generation from natural gas and renewable energy. "If the president is successful in implementing those policies ... that certainly provides upside to the market," he said. "This certainly has the potential to shift the market more quickly than a lot have anticipated." Still, U.S. companies face a significant challenge in South Korea: Qatari supplies accounted for 37 percent of its LNG imports in 2015. WATCH: What does Qatar own around the world?